Numerical methods of rating and tracking performance have been an integral part of performance management for a long time. They are used to judge individual performance, they are utilized during stack ranking, and they are a key element of 360-degree evaluation processes. Though they have certainly fallen out of favor in recent years, with companies such as Microsoft and Dell famously showing them the door, they retain a somewhat positive reputation for many modern companies. This is due in large part to the fact that they are regarded as a fair, objective means of rating performance. After all, what can be more fair and impartial than a number? The unfortunate reality is that numbers can be misleading. Ratings are not, and never can be, truly objective. Not only are they are an outmoded and unhelpful performance management tool; their untrustworthy veneer of objectivity gives managers a false sense of security. But before we completely turn our backs on ratings as a concept, it is important to address the question of why they are, despite appearances, intrinsically subjective. Performance ratings are used to make decisions relating to pay, bonuses, and promotions. Ideally, these decisions would be based on an accurate reflection of an employee’s performance and progress, but there is one glaring problem with a numerical system: the number used was arrived at by a human. This means there is scope for human error, and when discussing performance appraisals, the most pertinent human error to discuss is that of rater bias. Rater bias is a concept in social science which states that when an employee is being appraised, the evaluator’s judgments will inevitably influence proceedings. Common contenders include the “halo and horns effect” — a sub-conscious cognitive bias wherein one trait (whether good or bad), overshadows all other actions or traits. Another, less common bias is purposeful bias. In this instance, a manager might be threatened by a talented and successful employee. This would lead to the manager unfairly underrating the employee. Recency bias is probably the most common factor that influences performance ratings. It is natural for the human brain to focus on incidences and behavior patterns that have been demonstrated recently. But this means the employee’s performance up until that point is not being considered, so a rating would not be fully rounded, or take into account the whole picture. Recency bias leads us into one of the most serious issues regarding ratings and objectivity. 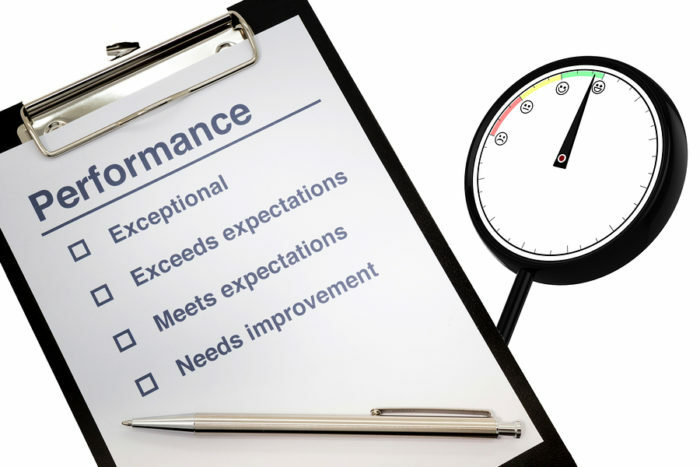 Often, performance ratings are entirely based on a single annual performance appraisal, which makes it difficult to adequately and objectively evaluate performance. For this reason, many companies, including Adobe, have made the shift towards continuous performance management. With this system, annual reviews are replaced with monthly performance discussions. This gives managers the opportunity to keep up to date with employee performance and progress. This increased familiarity with employees paints a much more reflective, objective picture of the employee’s current performance level. These sessions also bring to light what skills and strengths are being developed, and areas in need of improvement. There is an ongoing misconception that a shift to agile performance management necessitates the elimination of performance ratings. This is not the case, although many companies choose to do so based on the rapidly mounting evidence which suggests ratings are detrimental to employees and managers alike. Companies can still choose to incorporate performance ratings into continuous performance management; in fact, ratings will be all the more accurate and fair when using this approach. How do we measure and rate a quality that is innately subjective? This is a factor that certainly detracts from the objectivity of performance ratings. Important elements of any job, such as teamwork, professionalism, or the ability to demonstrate initiative, are not easily quantifiable and generally rely on the manager’s subjective interpretation. This dilutes the reliability of ratings even further, to the point where they are hardly representative of anything. For this reason, relying upon them to determine raises and bonuses is undeniably unfair. Setting performance ratings aside can be a challenge for any organization, particularly if they have been part of your company’s performance management process since your company was created. Organizational change such as this can be difficult, but it is necessary to reassess the validity and value of our performance management tools, in order to determine whether or not they are helping our companies thrive. With enough time and careful consideration, organizations can trade in ratings for something that may be more subjective, but which is more honest, forward-thinking, and conducive to long-term success.